Near-death experiences, or NDEs, are controversial. Thousands of people have had them, but many in the scientific community have argued that they are impossible. Dr. Eben Alexander was one of those people. A highly trained neurosurgeon who had operated on thousands of brains in the course of his career, Alexander knew that what people of faith call the "soul" is really a product of brain chemistry. NDEs, he would have been the first to explain, might feel real to the people having them, but in truth they are simply fantasies produced by brains under extreme stress. Then came the day when Dr. Alexander's own brain was attacked by an extremely rare illness. The part of the brain that controls thought and emotion--and in essence makes us human--shut down completely. For seven days Alexander lay in a hospital bed in a deep coma. Then, as his doctors weighed the possibility of stopping treatment, Alexander's eyes popped open. He had come back. Alexander's recovery is by all accounts a medical miracle. But the real miracle of his story lies elsewhere. While his body lay in coma, Alexander journeyed beyond this world and encountered an angelic being who guided him into the deepest realms of super-physical existence. There he met, and spoke with, the Divine source of the universe itself. 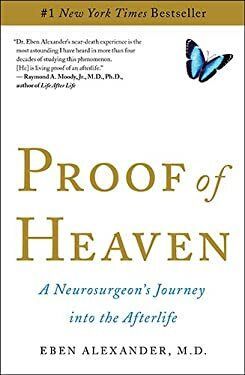 Advance Praise for "Proof of Heaven"
"Dr. Eben Alexander's near-death experience is the most astounding I have heard in more than four decades of studying this phenomenon. He] is living proof of an afterlife." --Raymond Moody, M.D., Ph.D., author of "Life Beyond Life"
Used Very Good (33 available) Great condition for a used book! Minimal wear. 100% Money Back Guarantee. Shipped to over one million happy customers. Your purchase benefits world literacy! Used Very Good (10 available) Great condition for a used book! Minimal wear. 100% Money Back Guarantee. Shipped to over one million happy customers. Your purchase benefits world literacy! New (116 available) BRAND NEW. Over 1.5 million happy customers. 100% money-back guarantee. Make your purchase count: support Better World Books' worldwide literacy partners.